This document highlights capabilities to edit existing campaigns, clone existing campaigns, and manage uploaded data. There are a restricted set of parameters that can be edited for an existing, activated campaign. We do not permit editing of parameters that will change KPI variables. This is an effort to maintain the integrity of data over time. Those parameters that do not affect variables within a KPI can be edited for an activated campaign as follows. Campaign - change goals, metric importance weighting, Level settings, and goal bar settings. Campaign - change team or change team members on a team assigned to a campaign. Only one team can be assigned per campaign. 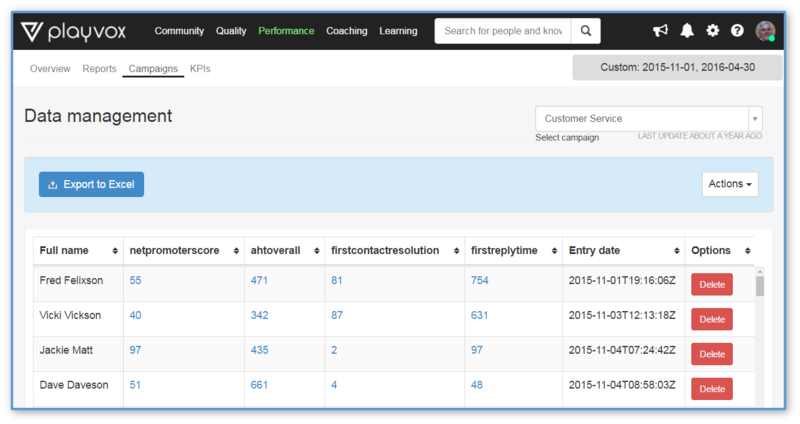 To edit KPI settings, go to Performance, KPIs, Edit. Changes are limited to Measure unit and operations within formulas to calculate KPIs. Variables within an existing KPI cannot be changed. To edit campaign settings, go to Performance, Campaigns, Actions, Edit. Go to Set Goals to change goals, weighted importance for each KPI, team assignment or members of a team, and Level settings for color bars in the dashboard displays. You can also change the Activation setting to Off (the campaign will not be visible to anyone except an administrator) or Publish Off (the campaign will be visible only to administrators and team leaders, not agents). If you need to change variables associated with a KPI or change team designation for a campaign, you will have to copy, or clone, the campaign and make edits to the copy and save it. This new campaign will require you to complete the campaign build process. And you will need to load data for this new campaign, either starting with data for day one, or loading historical data. Be aware that the new campaign will only reflect data moving forward (or historical data that you upload initially). To clone a campaign go to Performance, Campaigns, Actions, Clone. You will be prompted to confirm you wish to clone a campaign. Click Accept. A new campaign will be opened for you to configure. It will include all the parameters configured for the original campaign. You can now edit and change any parameters for any step in the build process before activating the campaign. Name, KPIs, Map Variables, Set Goals, Select Team. Once activated, you will have to upload the FTP data file with current day data and/or historical data to be reflected in the new performance campaign. For administrator's convenience, PlayVox provides a FTP file upload log. This log provides a historical record of file uploads and completions. Click on the white FTP log button in the upper right corner of the Campaigns dashboard. File uploads will be displayed. Click on the Details button to drill down into errors associated with a failed file upload. Where available, we provide indications of the type of errors. As part of the administrator capabilities, PlayVox allows you to manage data across multiple performance campaigns. You can delete, move, and copy data for specific agents and date ranges. Let's review. Go to Performance, Campaigns, and click on the blue Actions button for a specific campaign. Select Data Management. You will see a Data management dashboard. Select a campaign for view. And a date range for the data you wish to you will see a list of agents and their associated KPIs for this campaign. From here you can do several things. Click on an individual cell for a KPI and you can adjust or edit the value for that cell. This feature is intended to allow you to correct for one-off or random errors in data. Perhaps data was uploaded but it did not properly reflect one agent's activity for that day. Those singular corrections can be made here. Select the data range, scroll down to the agent, click on the cell, and make the change. 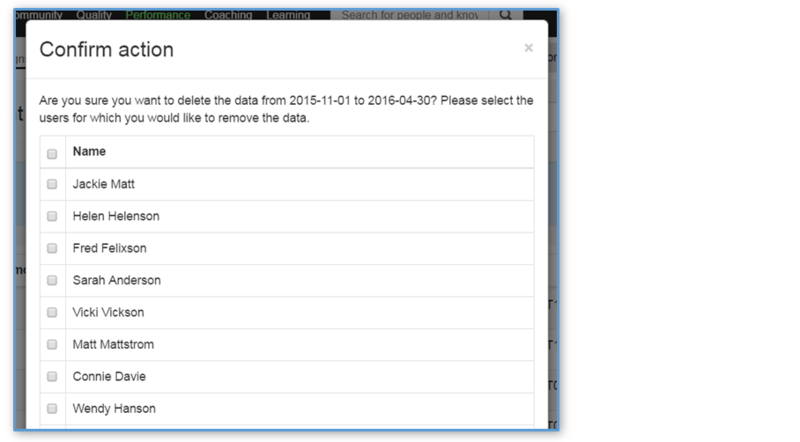 You can also delete, copy, or move blocks of data for one or more agents. Perhaps three agents are added to an existing campaign. Click on the white Actions button. Select delete, move, or copy data. A confirmation pop up window will ask you to confirm the dates or date ranges and to select agents. As a second level precaution, you will be asked to confirm delete by typing the word and click Accept. You can also move or copy blocks of agents and data to other campaigns. In this function, you are asked to provide a destination campaign for the agent and data. 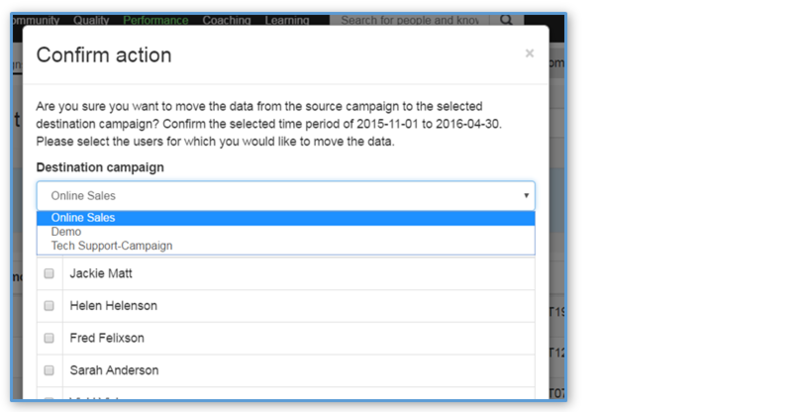 In the case of moving data, the data is moved from one campaign to another. Essentially, it is removed from the originating campaign. In the case of copying data, the data is copied from one campaign to another. The data now resides in the originating campaign and the destination campaign.